GINOWAN, Okinawa, Japan — Like rock stars pulling up in a tour bus at a packed arena, Marines with Materiel Readiness Battalion, 3rd Force Service Support Group, were greeted by dozens of smiling and screaming students upon their arrival at the AmerAsian School in Okinawa May 27. 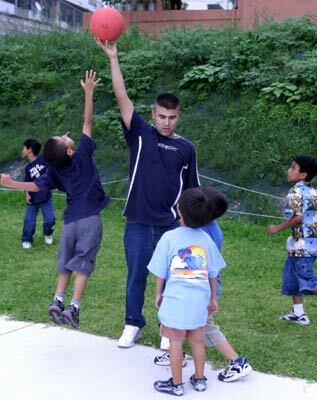 The Marines began their time at the school by playing games outside with the students, said Sgt. Amy S. Shandera, Minier, Ill., native. 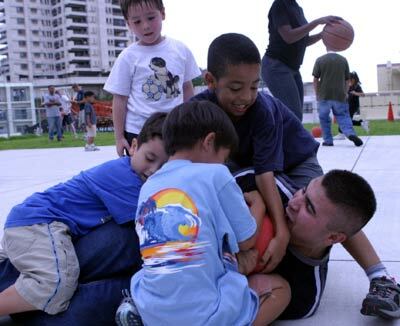 During a game of keep away, five children tackled a Marine holding a ball out of their reach to the ground. Students and Marines both picked up knowledge that day. In one classroom two Marines received a period of instruction on writing kanji from an enterprising 7-year-old student and her teacher. In the English language skills classroom, Marines helped the children with their spelling, grammar, and pronunciation. Sometimes, the students pick up bits and pieces of Spanish or other languages Marine volunteers speak. The students would never normally hear these languages in person, said Fad. Fad revealed that several of his students come from single-parent homes. “The presence of the Marines on a regular basis gives these kids the chance to be around a kind of father figure,” Fad said. The benefits of the Marines at the school seem to flow both ways.